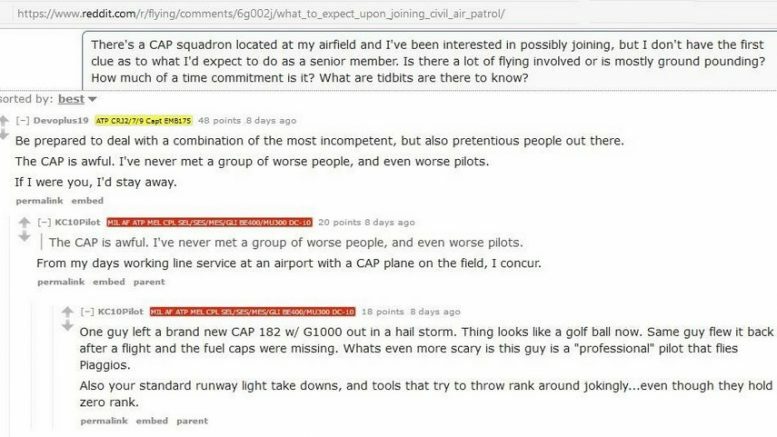 You apparently have like-minded sympathizers on Reddit who have equally negative experiences with CAP senior members. 2 Comments on "AuxBeacon Picture of the Day No. 17"
Why hasn’t legal action been taken? Call me stupid but CAP continues abusing because everything is done in-house. If the abused mbr/former mbr has all the evidence, why not go to court? Also, if you first. complain to your congressman and he doesn’t do anything, then go to the press! Has anyone ever figured out how much tax dollars are used and abused by CAP? Never hear a single bad word about the USCG Aux. That’s PFD: Pretty Frackin’ Damning.